Which Shuffleboard Table Should I Buy? Home > Shuffleboard > Which Shuffleboard Table Should I Buy? 30 Jan Which Shuffleboard Table Should I Buy? Shuffleboard is one of the original parlor games played around the world. Even though it dates back to the 1400s, people today still enjoy creating some fun competition by sliding the puck down a sanded piece of wood. Today, you can see this classic games in not only bars but inside homes as well. Handcrafted out of genuine hardwood and tournament-quality materials made to last for years, our shuffleboard tables are guaranteed to make a statement in your home. We carry our own styles of shuffleboard tables in our Generations line, that are custom made and completely original. We also have tables from California House, Hudson, Olhausen, and Brunswick– some of the top brands in the industry. We love California House because of the unique designs they offer for shuffleboards. Each table is made to order in the USA, providing exceptional quality and artistic composition. One of our favorite models is the Newport Shuffleboard Table. Unlike most styles, the legs on this table turn inward, creating a gorgeous and elegant look. You can find Hudson tables in recreational areas as well as professional tournaments. This is because of their consistency in ensuring a leveled table. They are one of the only manufacturers whose wooden planks are reinforced with maple inlays at the bottom each climatic adjuster attached. This means that when your table arrives at your home, it is ready to play with no extra leveling required. Aside from producing some of the highest quality billiard tables in the industry, Olhausen also manufactures shuffleboard tables. Their products include genuine hardwood that can withstand any climate. When you buy Olhausen, you can create a personalized design by adding a logo on the table to represent your business or favorite team. From sleek and contemporary to rustic and cozy, Brunswick has a wide variety of designs that will appeal to all types of players. Although they are also commonly known to produce pool tables, Brunswick’s shuffleboard tables provide the same high-quality standards. You can find these styles in our showroom in San Bernardino. Our Generations line of shuffleboard tables was created to carry on our legacy; by providing families with products they can enjoy with one another for years to come. Our Generations Pool Table collection also exemplifies our passion for the gaming industry. 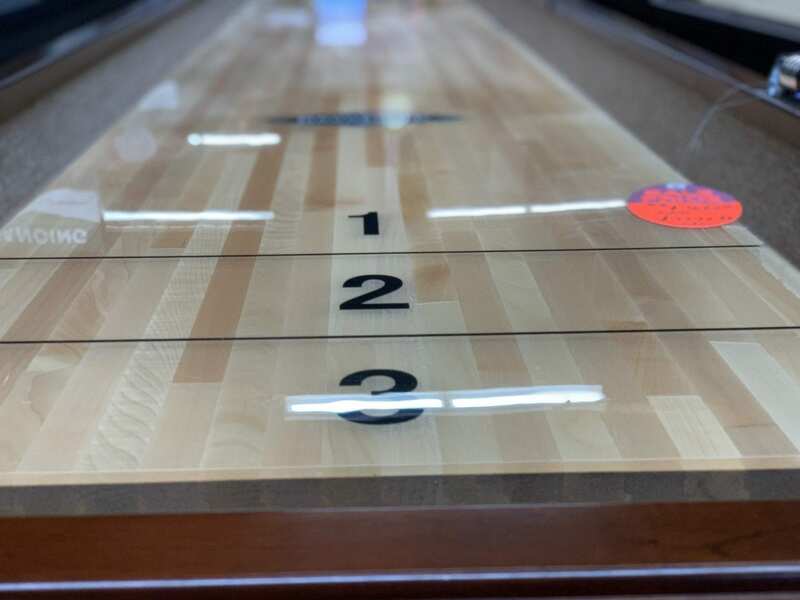 If you are buying a shuffleboard table for the first time, check out our Fundamental Shuffleboard Table. The simplicity in this timeless design makes it a perfect piece for any room style. All of these brands provide shuffleboard tables that are as much a furniture piece as they are a game table. The detail and functionality of each table ensure that you and your loved ones will be able to enjoy this game for many years. Looking to purchase one of our game tables online? We will ship it to you at no extra cost. Right now, we are offering 0% same-as-cash financing on orders $500 and up for 12-months! You can visit us in San Bernardino, right off of the 215 freeway on exit 43 for West 2nd Street. We are open Monday – Saturday from 9:00AM to 5:00PM. Our staff would be happy to help you find the perfect pool table for your home. Not in the area? Give us a call at (909) 885-3604, and we will answer any questions you may have.